The Hawksbills (Eretmochelys imbricata) are one of the smaller sea turtles species but are usually larger than the Olive and Kemp’s Ridleys. 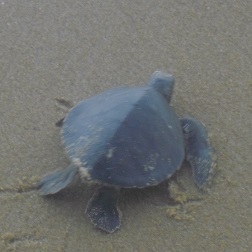 They have a narrow head and hawk-like mouth and have four lateral scutes like the Green sea turtles except the scutes of their carapace are over-lapping. They have a carapace like an egg-shape and their flippers have 2 claws. The color of a Hawksbill’s carapace is orange, brown or yellow and their babies (hatchlings) are mostly brown with light marks on the scutes. The Hawksbill can go up to 3 feet in carapace length (71 – 89 cm) and can weigh between 101 and 154 pounds. They eat sponges, sea anemones, squid and shrimp. They live typically around coastal reefs, rocky area and lagoons and can nest at an interval of 2 to 4 years and 3 to 6 times per season. The Hawksbill on average lays about 160 eggs in each nest and take up to 60 days to develop. They are the most tropical of all sea turtles and can be found in tropical and subtropical waters of the Atlantic, Pacific and Indian Oceans.